HONOLULU (KHON2) - Five of Leeward Maui’s most resilient reefs are found in State managed areas and offshore of a federal wildlife refuge. That was a key finding from a 2018 survey that offers a snapshot of more than 22,000 coral colonies at 51 sites along Maui’s South and West shores. The results suggest that coral reefs can be managed to build resilience and increase survivability in an uncertain climate future. 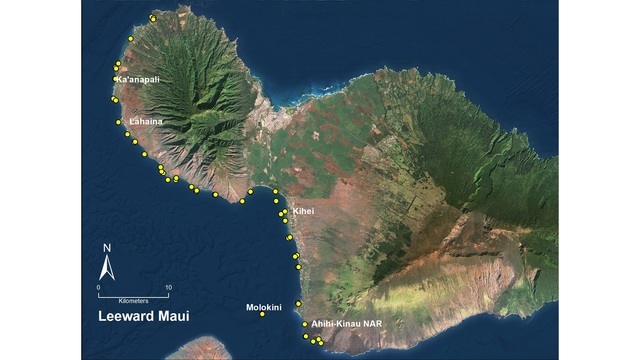 The State’s Molokini and Honolua Marine Life Conservation Districts, Kahekili Herbivore Fisheries Management Area, Ahihi Kinau Natural Area Reserve, and the reef offshore of the U.S. Fish & Wildlife Refuge at Kealia—a natural wetland that protects coastal resilience—are amongst the healthiest reefs in Leeward Maui. Maui’s Leeward reefs face a combination of threats, including sediments, nutrients and high fishing pressure. Sites with high fishing pressure included North Kāʽanapali, Hanakaoo north of Lahaina, and Kealia in South Maui. Kihei and North Kaanapali were areas with more pronounced nutrient and water quality issues. Identifying the most pressing local threats and the most resilient reefs across the state is critical to the Marine 30x30 Initiative. “Key in reaching the 30x30 goal is to create a cohesive, ecologically connected network of marine areas that, managed collectively, will rebuild and sustain productive nearshore fisheries, cultural and social benefits, and coastal and reef resilience,” said Acting DAR Administrator, Brian Neilson.